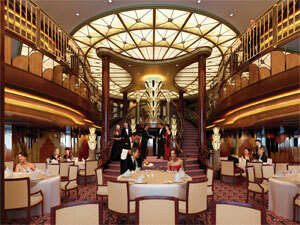 Changes in a cruise line’s fleet are always exciting announcements, but in the case of Cunard, they’re monumental. During last year’s retirement of the Queen Elizabeth 2, throngs of people flooded the docks to send the beloved ship off with a dazzling fireworks display. Even the Queen herself came to Southampton to bid farewell to the infamous ocean liner. Cunard passengers have anticipated the unveiling of the line’s newest ship – which marks a return to the glory years of the three reigning queens – with the same loyal enthusiasm. Some details of the new Queen Elizabeth have now been released, and the countdown to April 2 when bookings are officially open for sale has begun. Part of Cunard’s appeal is that the cruise line breathes life into an era that time has forgotten, and transports passengers to the golden age of ocean crossings. Every attention to detail is made on Cunard’s ships, and crew members are trained at its elite White Star Academy. The Queen Elizabeth will provide this same royal treatment to guests, as well as some new modern amenities to blend old-world traditions with new-age comfort and décor. Among the returning favorites is the Britannia Club which first premiered on the Queen Mary 2, allowing guests sailing in a balcony cabin a private dining room with single seating dining. The Queen Elizabeth’s maiden voyage embarks from Southampton on October 12, 2010 on a 13-night odyssey to Vigo, Lisbon, Seville, Gran Canaria, Tenerife, La Palma, and Madeira. Prices start at $2,995 per person. To celebrate the ship’s maiden season, Cunard has planned not one – but five inaugural itineraries, because in the cruise world, the queens of Cunard run the show. For more information about the Queen Elizabeth click here.